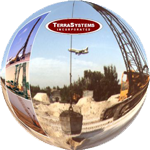 TerraSystems specializes in ground improvement contracting, primarily in dynamic compaction, rammed aggregate columns, wick drains, and vibro systems. We have been offering ground improvement services since the early 80’s and have pioneered many of the current ground-improvement techniques. Our greatest asset is our unparalleled engineering background, allowing us to assist owners, engineers, and contractors in evaluating the feasibility of using ground improvement on their sites. We offer a wide range of services, thus we do not have a “one-size-fits-all” mentality in recommending a proper technique. In many instances we have advised our clients that they do not need ground improvement or to use foundation systems unrelated to our service areas. You can be assured that solutions that we recommend are both cost-effective and performance driven.